“The Young and the Restless” spoilers for Wednesday, October 3, tease that Nick (Joshua Morrow) will receive news from Phyllis (Gina Tognoni). 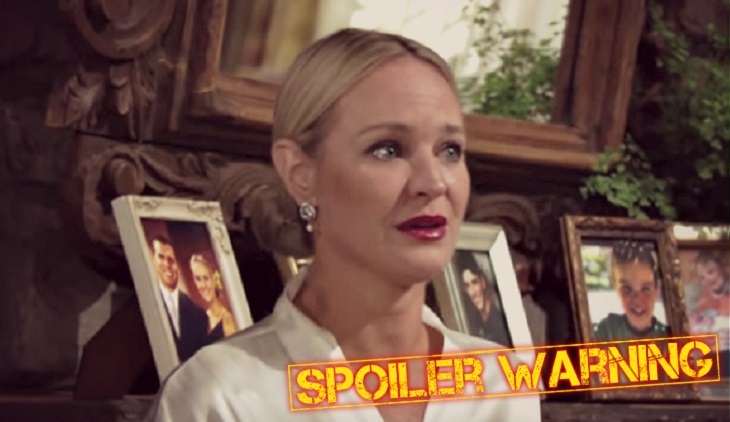 At the Abbott mansion, Phyllis reveals that Billy’s (Jason Thompson) coming as her plus one. After Nick gives his blessing, they revisit the topic of their hookup secret. Phyllis and Nick reiterate that they won’t blab about what happened that night. At the cottage, Sharon (Sharon Case) wonders if Mariah’s (Camryn Grimes) got all the facts. She questions Summer’s (currently played by Bayley Corman) credibility, but Mariah points out that she trusts Kyle (Michael Mealor). He backed up Summer’s claims, so Sharon realizes Nick indeed betrayed her. Mariah contends that it was a one-time mistake and won’t happen again, but Sharon continues to struggle. She weighs her options and ultimately decides to go through with the wedding. Mariah doesn’t think Sharon’s had enough time to process all this, but Sharon insists she’s ready. She just wants Mariah to pretend they never talked about it. After Faith (Alyvia Alyn Lind) comes in and Summer arrives, Sharon sends them off with Mariah. She promises to head over to the church soon. Over with Arturo (Jason Canela) and Abby (Melissa Ordway), they have a chat about marriage. Arturo suggests that it’s not really his thing. He doesn’t think a wedding is what makes a relationship work or last. Meanwhile, Victoria (Amelia Heinle) finds Billy at the church and asks about the Jabot chaos. She got updates from Abby and grew concerned. Billy’s irritated at first, but eventually eases up. He assures Victoria that he’s headed to rehab, so she’s glad to hear it. When Victor (Eric Braeden) shows up, Victoria reveals him as a surprise. She assures Nick that their dad comes in peace. Summer also meets up with Nick briefly and makes it clear that her lips are sealed. Back with Mariah, she tells Tessa (Cait Fairbanks) about spilling the one-night stand secret. Mariah starts to worry as the minutes tick by. Sharon’s still a no-show, so the minister’s getting nervous. Mariah isn’t getting any texts back, which leads her to return home. She calls out for Sharon around the cottage, but her mom’s nowhere to be found. At the church, Phyllis and Billy share some sweet moments before a shocker. When Billy drops some marriage hints, Phyllis is taken aback. She wonders if that was a proposal, so Billy confesses that it was. He wants to make Phyllis his wife! Finally, Mariah runs back in looking frazzled. She corners Nick and admits she doesn’t have a clue where Sharon is. “The Young and the Restless” spoilers say some gripping scenes are coming up. We’ll keep you posted as other Y&R details and rumors emerge. Stay tuned to see what’s next in Genoa City.